Hopkins Village, located on the southern coast, is the mango capital of Belize, boasting over twenty varieties. The mangos have names such as blue, Julie, Harry, #11, thunder shock, white, ballet, black, common, belly full, apple, and well, one can go on and on recalling the many names and describing their favorites. On June 2nd and 3rd, the friendliest village in Belize celebrates the beginning of mango season with a free two-day family-friendly festival that showcases unique culinary delights and Hopkins’ culture, music, and community spirit. This year, the morning begins at 6am with Floyd Arana’s dory fishing contest. There are many prizes, such as most fish, most weight, biggest barracuda, and more. The unique twist? A 20% qualifier is added to each category for those that include fisherfolk under 15 years old. While the fishermen are out, vendors make their final touches on their booth space as they are competing for “best decorated booth.” Jungle Jeanie’s by the Sea leads a yoga session for all ages and skill levels to Caribbean vibes. Jeanie has hosted yoga for decades at her place, but for this special day, she takes yoga to the masses. The official kick off is 11am, but the live-music is already in full swing. Attendees will discover over 40 booths filled with hand-made jewelry, arts, and crafts. Pink conch shell necklaces and matching rings, lionfish earrings, and cohune palm pendants abound. Wooden bowls and serving pieces made from local hardwoods, such as the prized rosewood, fill tables. Other woods to lookout for are the m’lady, poison, and purple heart. Hopkins has talented woodcarvers that can make custom pieces too. Brightly colored hammocks and paintings fill other stalls. Healing concoctions such as hand-made salves, lotions, and even bug bite creams can also be found. The challenge will be how to take it all back home. Of course, mangos rule the day and there are boundless ways to showcase them in all the many food offerings. There is everything from sliced mangos sprinkled with a spicy rub, to mango chutney, mango chimole, mango smoothies, mango ice cream, mango cake, and just about anything mango! While mangos are the featured food, there is plenty of non-mango items like home-made sausages in mustard, chicken fingers, pizza, shrimp, and fish burgers. There are many vegetarian options as well, such as veggie paninis and bean and cheese Johnny cakes. Entering Hopkins, along the road, many people will set up make shift stands to sell street tacos and panades, while the restaurants make certain to have a mango-featured menu item. When attendees need a break from all the shopping and eating, they can shift into total relaxation mode by visiting the “spa booths” that offer massages or pedicures. While other attendees can be found on the putt-putt golf course beside the festival that features the “wonders” of Belize including the blue hole, Bocawina’s ziplines, and Cockscomb Basin Wildlife Sanctuary. From a distance, attendees listen to see if they have won some of the many raffle prizes given away regularly. Who doesn’t want to win a free dinner, hotel stay, or tour? There are many activities for children, whether it’s face painting or participating in the children’s story hour. Playground equipment is in the center of the festival luring children to slide and swing, while parents watch in the shade, enjoying the talented artists of Hopkins. It’s no secret that Hopkins is home to some of the most talented artists in Belize and the world. 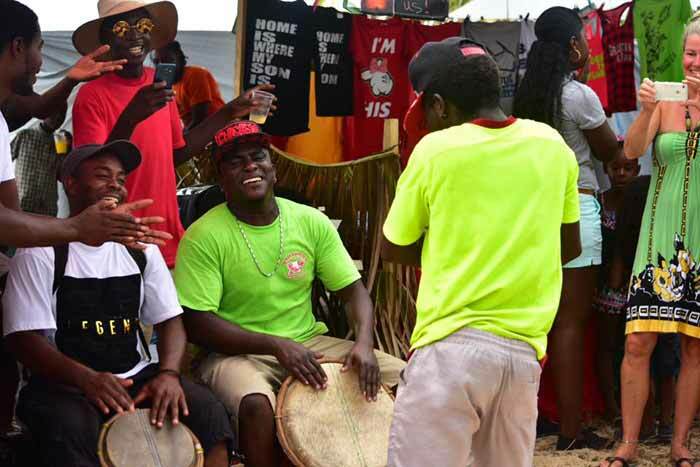 They make it a point to return home for the Mangu Fest as they want to showcase their hometown pride at an event that pays tribute to cultural live music and those that keep it alive. Parranda, the blues music of Hopkins, is front and center and features Drumming, an important part of the Garifuna heritage. The Saturday festival ends at 8pm, but the fun doesn’t stop. Attendees continue to go out in the community and enjoy more of the food they just got a sample of earlier. Many of the local restaurants host live music that continues into the early morning hours as people go from place to place following their favorite artists. On Sunday, the festival starts back up with more music, food, and fun and includes awards ceremonies to announce the winners of the many activities including the Travellers cocktail contest. The goal of the Hopkins Mangu Fest is to promote Hopkins as a tourist destination in a fashion that builds on Hopkins uniqueness and promotes cultural preservation by featuring authentic Garifuna food and music through a clean, wholesome, culinary and culturally fun festival. It also provides economic opportunities during a time that has traditionally been referred to as “maga season” or thin season. 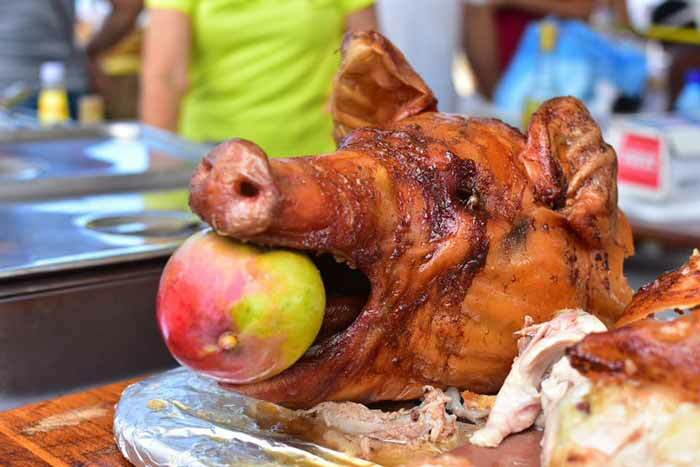 Belize still follows the rule of seasonal eating…we do not force fruit before its time. The hot summer months are some of the best times for us. Childhood memories are full of us running around half naked, climbing trees to pluck succulent plums and mangoes from the branches. Small children working together to pull watermelons almost as big as their bodies, warm and ready to burst with sugary goodness straight from their vines. I remember my cousins and I poking large sticks up trees to hit custard apples before the birds ate them all at once. Yes, from April through June or July, it’s the time to eat every possible fruit in sight. And for me, May brings my favorite time of the year: Mango Season! As if thoroughly understanding my complete and utter devotion to the delicious fruit, one of my favorite destinations in Belize has even come up with a festival celebrating all things Mango. Known as Mangu in the Garifuna language, the fruit is the center of attention in Hopkins, Stann Creek. Eight miles south of Dangriga and four miles off the highway, Hopkins is referred to as the top cultural destination in Belize, and with good reason. Its approximately 1,500 inhabitants are warm and friendly, their vivacious personalities just embracing visitors to Hopkins’ shores. 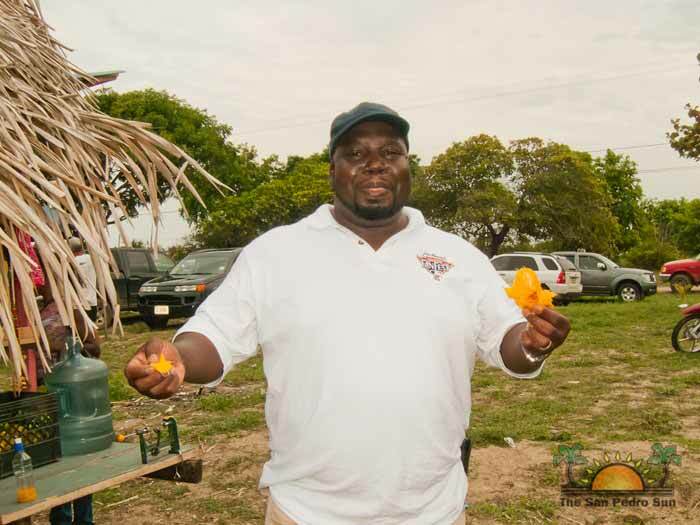 This year, hundreds of Belizeans and visitors alike descend to the seaside village on June 2nd and 3rd, ready to indulge in the over twenty varieties of mangoes that grow in the area. With names such as blue, Julie, Harry, #11 (a personal favorite), thunder shock, white, slippers, black, common, belly full, apple, and more, the fun is discovering new favorites and flavors. Hopkins hosted all the excitement this weekend for the annual Mango Fest. 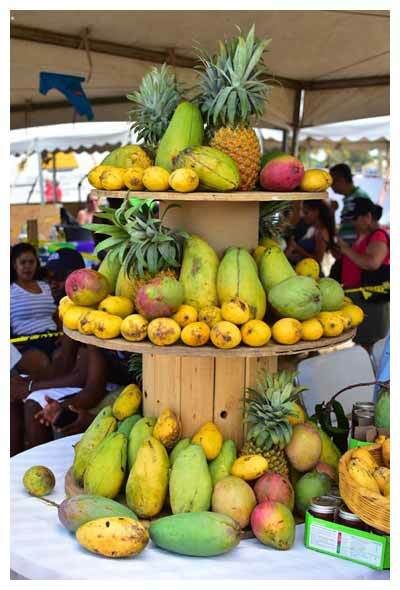 Hopkins Mangu (mango in Garifuna) Fest—Fruit, Family, & Fun and now home of the “raffle cup” was held June 2nd and June 3rd. Next year’s date is already set for June 8th and 9th. Madisco sponsored a prize for the “best food.” Chef Sean Kuylen’s mango pulled pork on tostones won, with Miss Deb’s “mango tango burger” a close second. Honorable mentions went to Almira and Desmond Augustine with their chocolate dipped mangos and to Rose Lopez and her spicy chicken wings in mango sauce. For the first-time ever, the festival extended over the street to meet the demand for more booths. Every food booth featured at least one mango menu item and vendors showed their creativity as they had a variety of foods, including mango chicken bake, mangos dipped in chocolate, mango nachos, mango ceviche, and chicken fingers with a mango sauce. Sweet Waata sponsored free water for all festival goers. Individuals could also purchase a “raffle cup” to use throughout the day. Each cup had a unique number and could win multiple times. Prizes were many such as Bocawina zip-line tour, Noawell’s Fishing and Tours snorkel trip, round-trip flight on Tropic Air, and many more. The goal was to reduce the garbage from the festival, while providing a souvenir raffle cup as well. Baha Fiesta won the “best decorated” booth for the second year in a row and will receive a free booth at the 2019 festival, which will be held June 8th and 9th. Perhaps the highlight of the festival for some was the Travellers rum/mango cocktail competition. The entries had a private judging that narrowed the field to three. Those three competed in front of the crowd, the judges carefully tasting and scoring. It was a close race, but Pam Gutoff of Winschief Beach Bar & Cabanas “Mango Bango” was the winner. Pam will receive a case of One Barrel. Windschief also held a mini golf tournament on Sunday after the festival ended. Live stop music played throughout the day. Lloyd Augustine, C-Wills, Bredda David, Griga Boyz, Turtle Shell Band and Pen Cayatano, Sweet Pain, and MohoBob were just a few of the featured acts. If you missed this year’s festival, be sure to save the date for 2019—June 8th and 9th. The Hopkins Mangu Fest would not be possible without the generosity of our sponsors and supporters! Thank you! Executive Host Sponsors are the Belize Tourism Board (BTB), Belikin Beer, Traveller’s, and Quality Poultry Products. Bronze Sponsors: Dean Wallis, Mouflon Carts Belize, Shallow Bay Beach House, Villa Verano, Happy Go Luckie Tours, Coconut Row, ButtonWood, Motor Solutions, Cosmopolitan Guest House, Belizean Dreams, Hoover Office Supply Belize Unit, and Marie Sharp’s. Last edited by Fisherjames731; 06/25/18 01:04 AM. 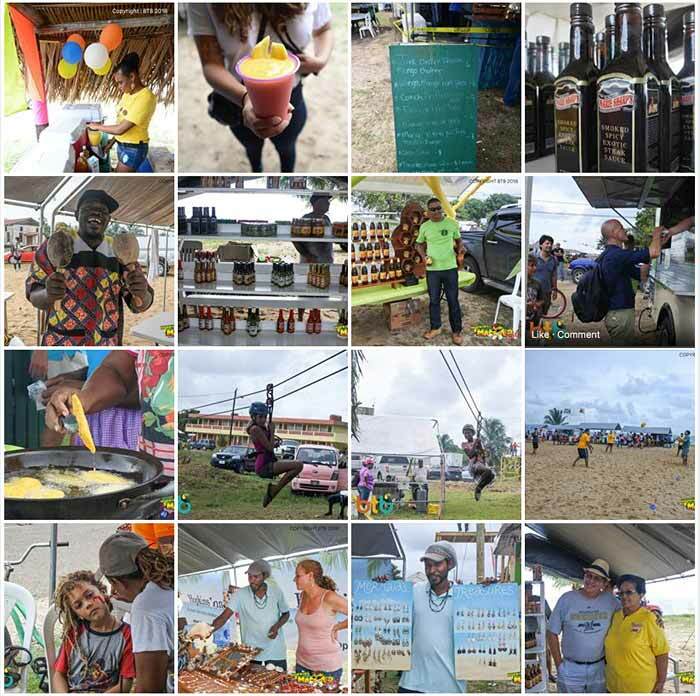 The Belize 2018 Mango Fest was a mango-filled extravaganza! This exciting, family-friendly, two day event celebrated everything mango, ranging from mango-inspired dishes, jams and jellies, candies, and drinks. Local companies like Marie Sharp, Belize Marketing & Development Corporation & DML Bamboo Straw were there. There were plenty of competitions and games, live music, and dancing.